The 1956 German Grand Prix was held on August 5. It was the seventh race of the 1956 Formula One Season. Juan Manuel Fangio dominated the weekend in his Lancia-Ferrari, leading the entire race from pole, and setting the fastest lap. Maserati driver Stirling Moss was second, 46.4 seconds behind, and Jean Behra was the only other driver on the lead lap, but more than seven minutes behind. None of the British teams made the trek to Germany, meaning that the entire field was nothing but Ferraris, Maseratis and a pair of French Gordinis. ↑ "1956 German Grand Prix". formula1.com. 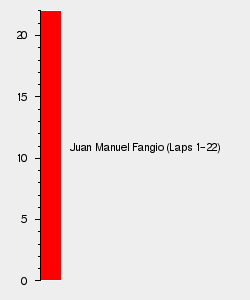 https://www.formula1.com/en/results.html/1956/races/148/germany.html. Retrieved 4 August 2018. * Nürburgring and Hockenheimring alternated between each other during these years.